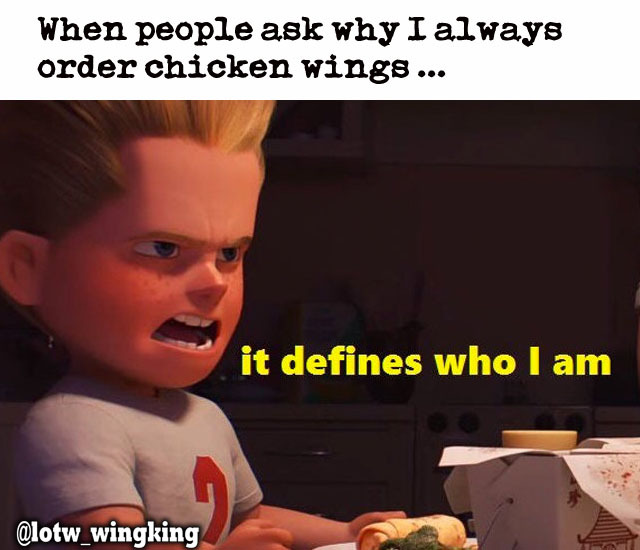 I am Lord of the Wings after all. My fave was probably the Raspberry Cassis, followed by the Oreo. But realistically, they were all decadent and very good. Offering bowls were used in various cultures for religious and spiritual offerings to the gods. Bones were used to tell the future. Don't read into it too much, these were the leftovers of ambrosia. 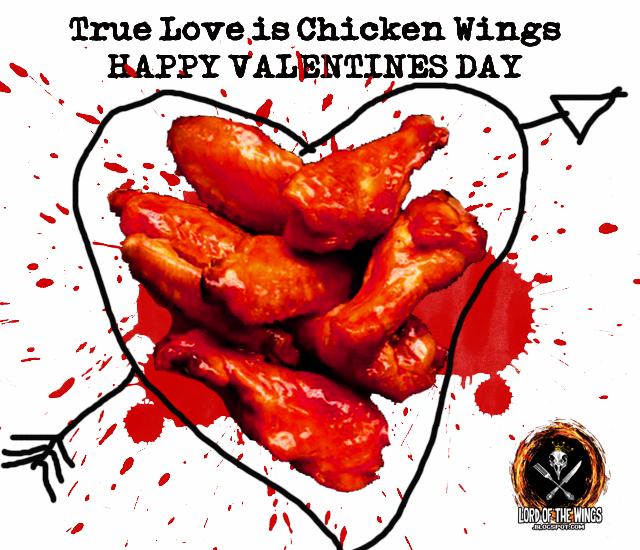 You don't need anyone else to be in love, because chicken wings love you back unconditionally. 1.2 Kilos of wings (about 25) with $5 off! 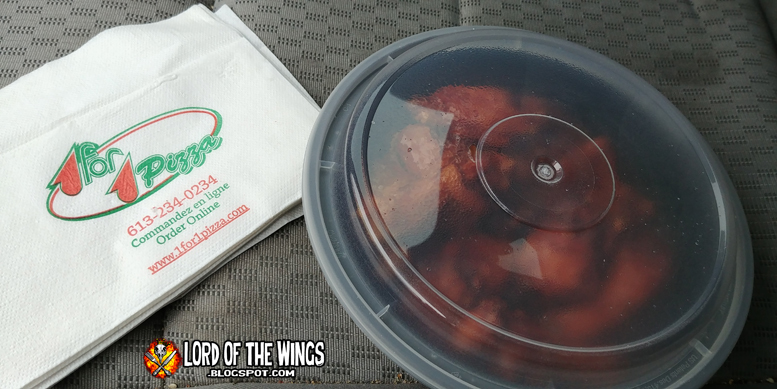 Then I looked a little closer ... these wings are from Tillsonburg. I grew up in Tillsonburg! 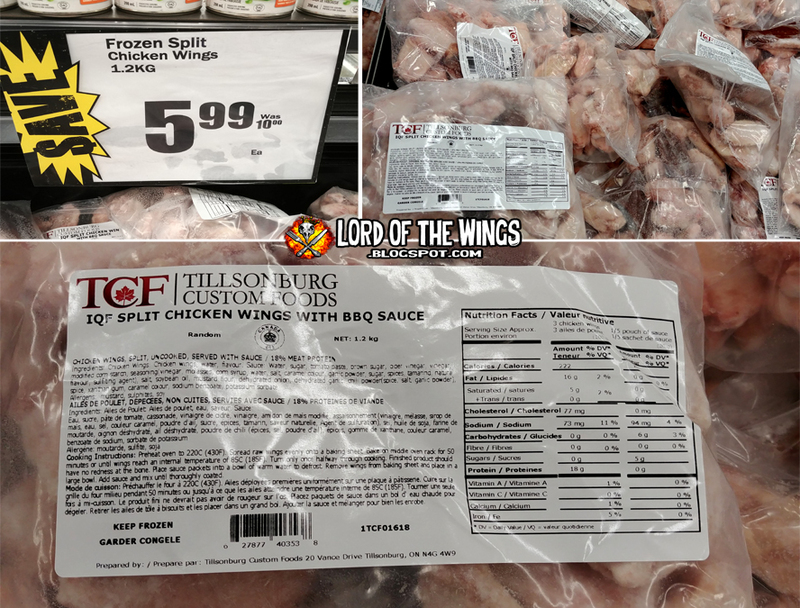 Growing up there I when I was younger there was nothing special about wings and the town, but I believe that Tillsonburg Custom Foods is a big processed food developer now. We got some of the wings and decided to try them for dinner. The wings were a good size, but they looked kind of funny. 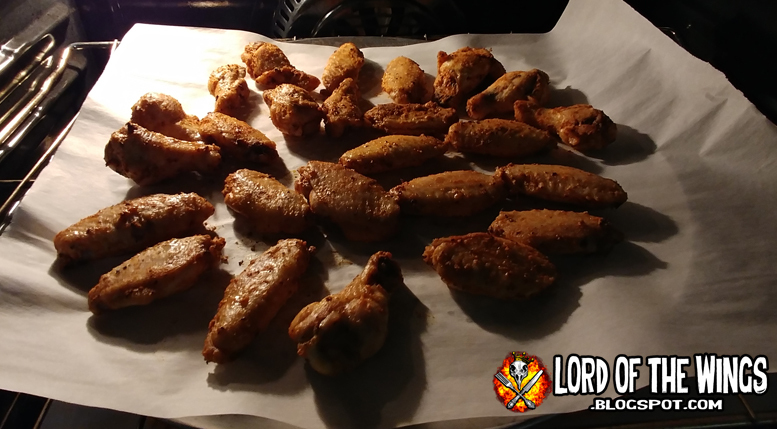 They also looked really plain, so I tossed them in a pepper, garlic, chili powder mix then into the oven on parchment paper for about an hour. After roasting for a while they did not look too bad. The sauce was thick and when the wings were done baking, I tossed them in a bowl with the sauce. After saucing them, I put them back in the oven to bake for about another 10 minutes. I. I am not sure if these look good or not. At the time they look good, but now I'm not so sure. So after about an hour and a half, the wing dinner was ready to be served. We had them with some waffle cut fries and a veggie platter with some dip. Not a bad combo eh? 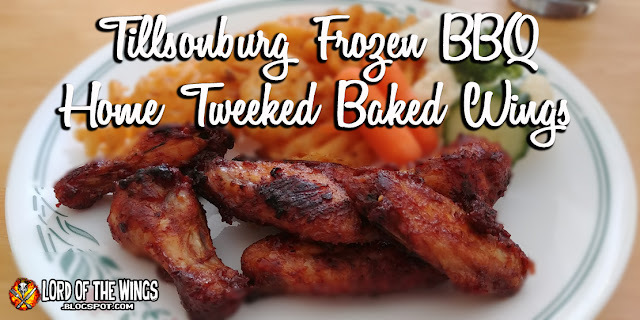 I have to say I wasn't super impressed with these frozen wings. I'm not a big fan of frozen wings all around. These were ok - the chicken meat was a medium tenderness; not tender enough, but not tough either. The skin wasn't that crispy, which yes is party from the problem from baking, but also from chicken that is cooked straight from thawed. Fresh is always best, but fresh isn't as always convenient..
That being said, I think I was able to transform these wings enough to make them not too bad. If I had just followed instructions on the package, I would be left with unseasoned wings with generic sauce. 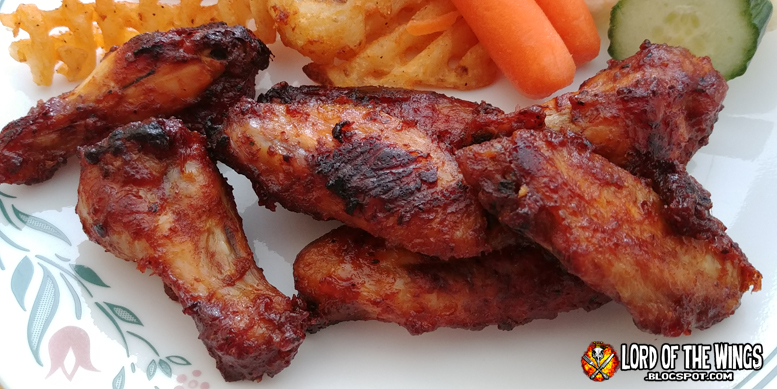 By seasoning the wings before saucing, I gave them a flavour base that was slightly spicy and garlicky. 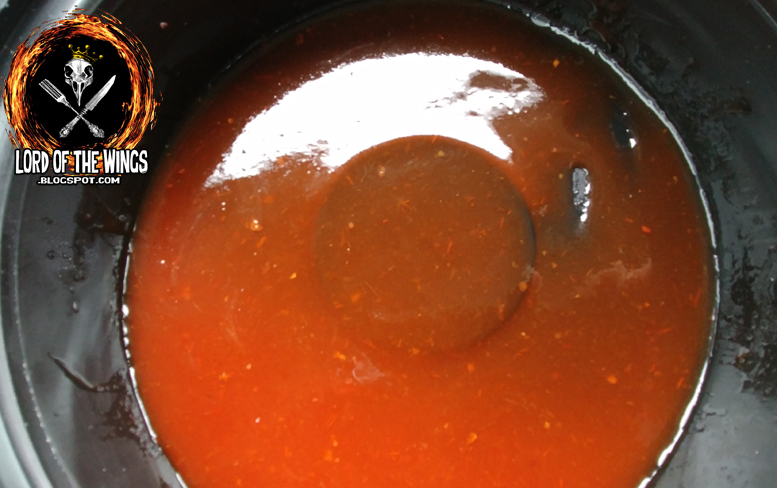 Then the sauce I elevated to make it more savoury and spicy. 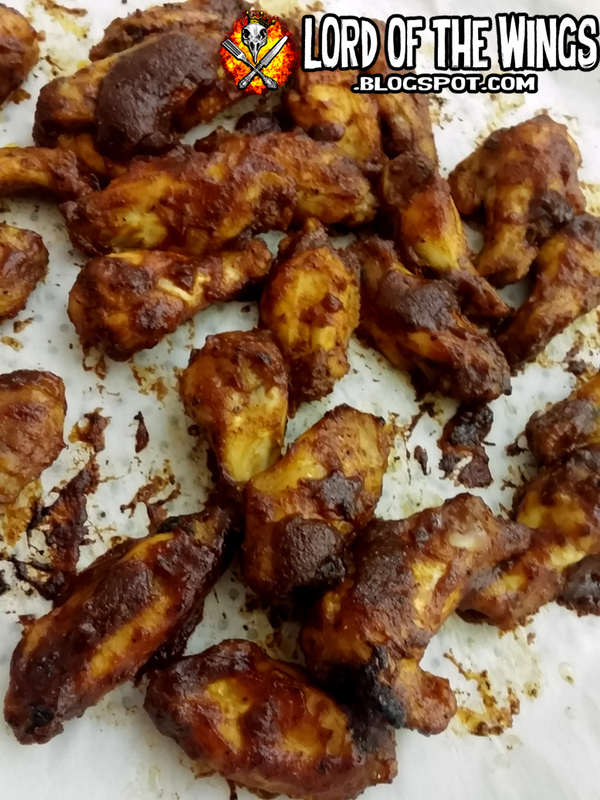 The result was a garlic, spiced chicken wing with some sweetness. We ended up buying two bags but I'm not sure I would buy them again. 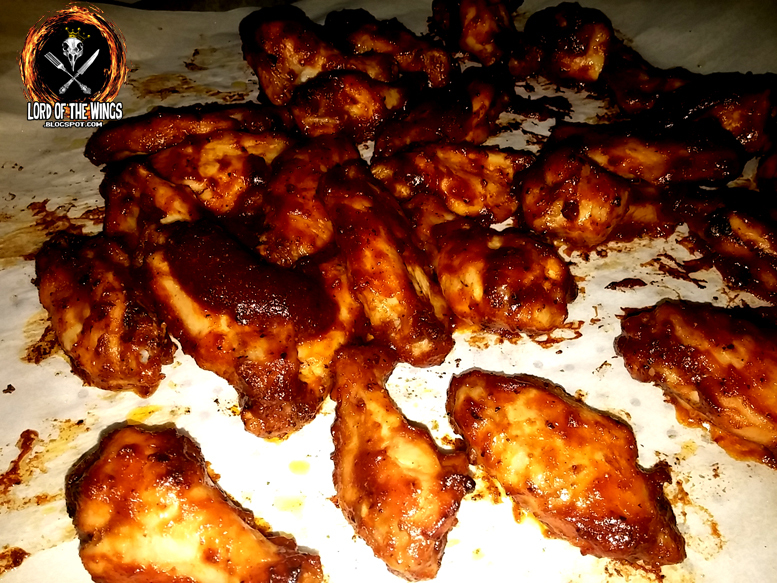 With the remaining bag, I will either thaw, brine and bbq grill up these wings and apply sauce to them to give them a smokey, grilled taste. That, or thaw and deep fry and hope that we could get a crispy skin. But I think the bbq route would be better since you are probably not going to get a crsipy skin either way, so might as well put them on the 'que. And you do it every time . . . and there's like 10+ flavours . . . why? So there's a mild snowstorm happening outside, I'm running errands and I decide to get some lunch. I'm in Orleans Ontario and I decide I'm feeling like wings (big shock) and I want to try somewhere new to me. I saw a little pizza place and stopped - but the doors were locked. They weren't open until close to the evenings on a Monday. So I keep driving and I see 1 for 1 Pizza and decide to try them out. Of all the years I have lived in or visited Ottawa region, I have never gone to 1 for 1 Pizza. It is a pizza chain only in the Ottawa area, and everything about it just reads basic pizza to me. I mean their name is 1 for 1. 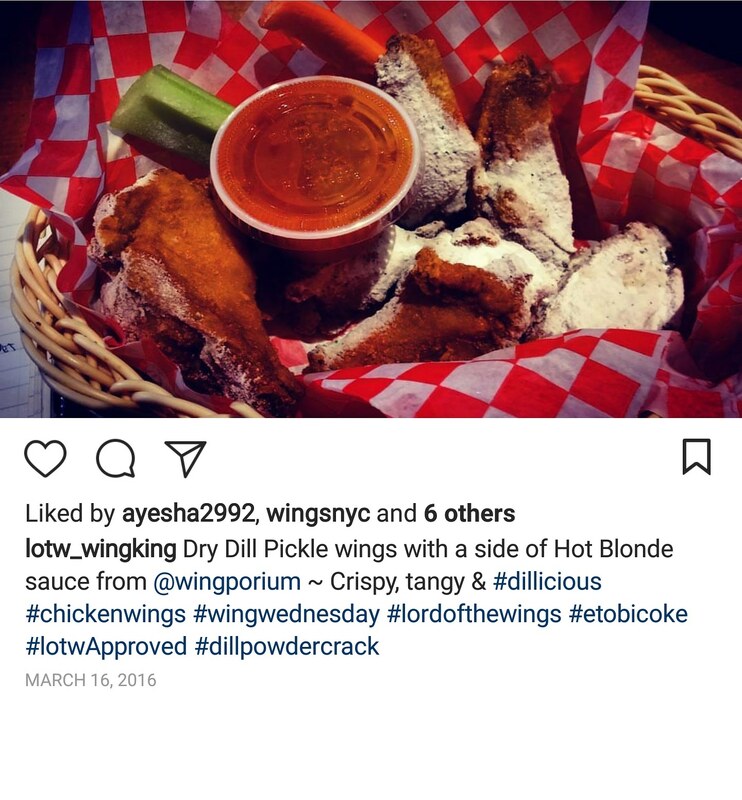 When I was in Toronto there was 2-4-1 Pizza, and even 3-4-1 Pizza (they had good wings) but 1 for 1 sounds like not a great deal. Right? But you never know unless you try. When I pulled up outside the store, I saw lots of ads for deals and combos and there was definitely some for wings. The restaurant itself was clean and had some counter seating if one so chose. 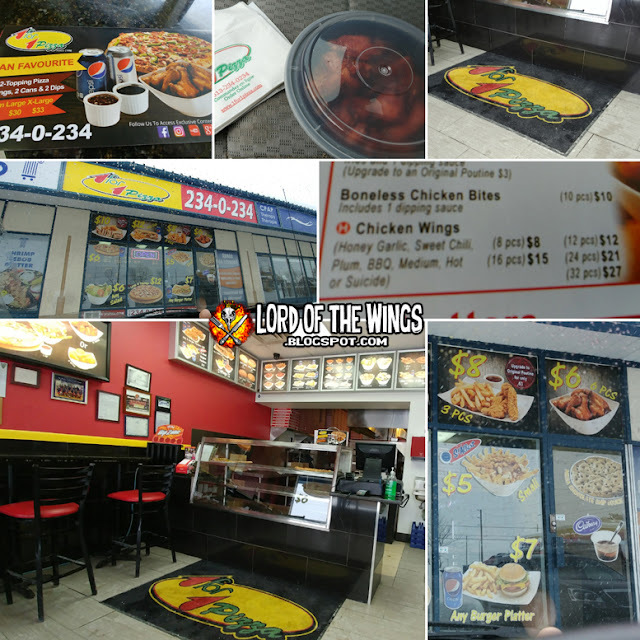 I took a flyer/menu and also noticed a bunch of combos for wings: wings and fries, wings and chicken, wings and pizza. 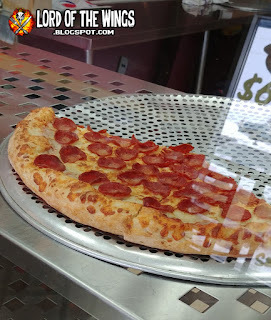 There was part of a pizza for slices sitting in the display case, and while I had thought about getting some wings and a slice, I was not enticed by the slices themselves. Looking back at the photo above, the pizza doesn't look bad, but in person it just was not appetizing. My gut feeling about the pizza not being great seemed to be confirmed. 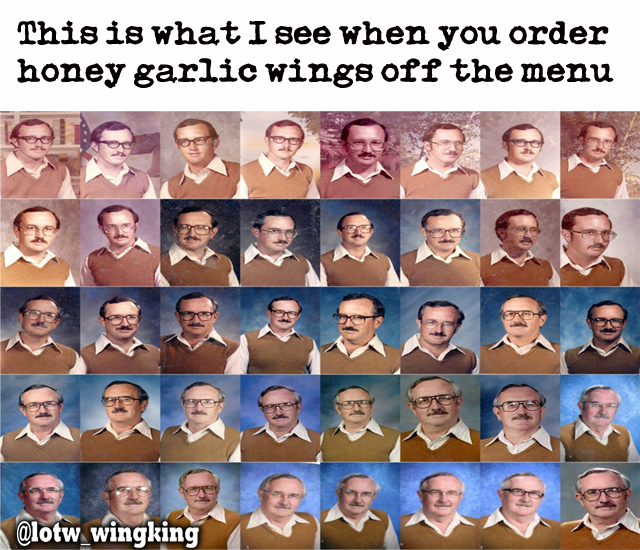 That's ok, I was here for wings anyway. 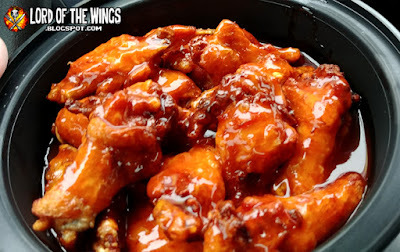 I heard my wings dancing away in the deep fryer from the seating area. The place was dead, and almost no business while I was there. It didn't take long for my wings to be served to me. It came in a solid plastic take-out container, which I like. These are hearty containers and I'm not ashamed to say I was them out and reuse them for leftovers all the time. I also feel better because you can recycle this over a styrofoam container. 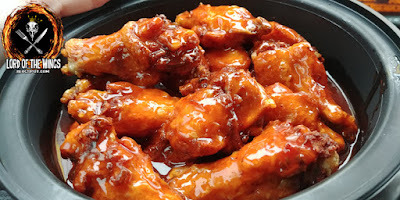 Wings come by numbers not pounds - I went 8 wings, but you can get 12, 16, 24 etc. 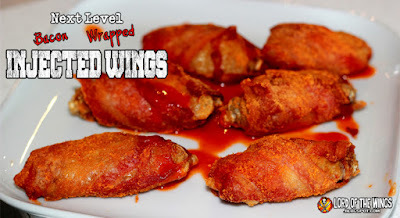 The wings are from frozen I'm pretty sure, and they are deep fried naked (no breading or dusting). No sides like veggies or dip come with them. The wings are small all around. They aren't big at all, and they are pretty average meatiness for their size. The wings were both crispy and soggy at the same time. When the skin was crispy, it was a great texture, but some were not, and that was not so great. I do believe some lost their crackling skin due to the lake of sauce, but some were like that even though they were fresh fried and at the top. I ordered Suicide which was 3rd Degree sauce, and they were VERY GENEROUS with that sauce. You can see how much was left over after my wings, and that's pretty awesome. 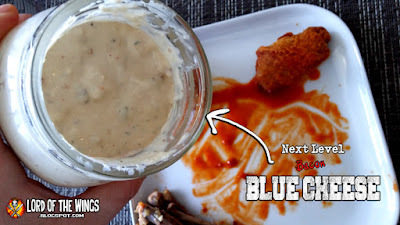 While the sauce was good, the wings had a general off-putting taste to them themselves. Like they had been in the freezer too long or that they were cooked in old oil. Even the 3rd Degree couldn't cover it up, but it wasn't so bad that I didn't eat all the wings. 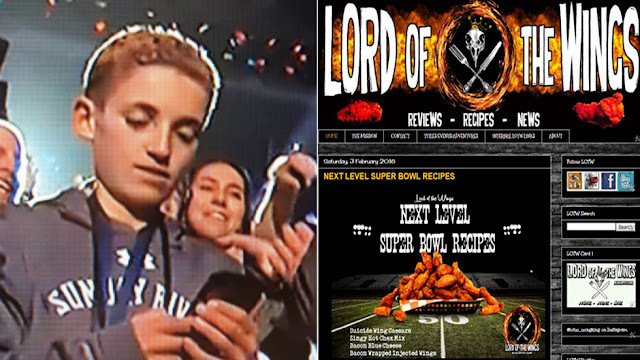 The Super Bowl was a food bust for me this year - we were going to do up a big wing feast and app platter, but needed to organize and clean the apartment in order to deep fry, but then that got delayed and life happened and we ended up ordering out. 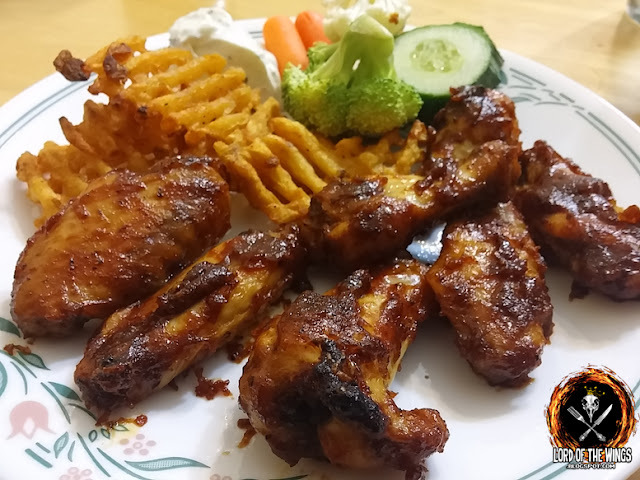 That in itself was an ordeal where I ordered wings and they never came with out takeout order, and I'm still in negotiations with a complaint department and well, here were some tasty wings I made last year. For years I have been developing, tweaking and revisiting my SCORE guide for the restaurants that I review. There have been multiple versions with the point amounts getting bigger, then smaller, then bigger again. The point of THE SCORE is to document in a quick visual chart the quality and options of a restaurants chicken wing offerings. I want to make my wing reviews 'scientific' and measurable so that anyone read it knows it's not just an opinion. This is mostly an information section, to get an idea about the wings. There's no score because this information is more about the description than evaluation. PRICE: how much do the wings cost and how many do you get approximately? 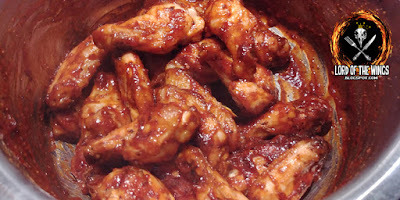 STYLE: what type of chicken wing are they - How are they cooked (fried, baked, smoked, breaded etc). also if there is a particular style, such as Thai-style, stuffed etc. SAUCES: what are the different flavours available? I will highlight in bold the flavours I am reviewing. WETNAP FACTOR: How saucy are these wings? 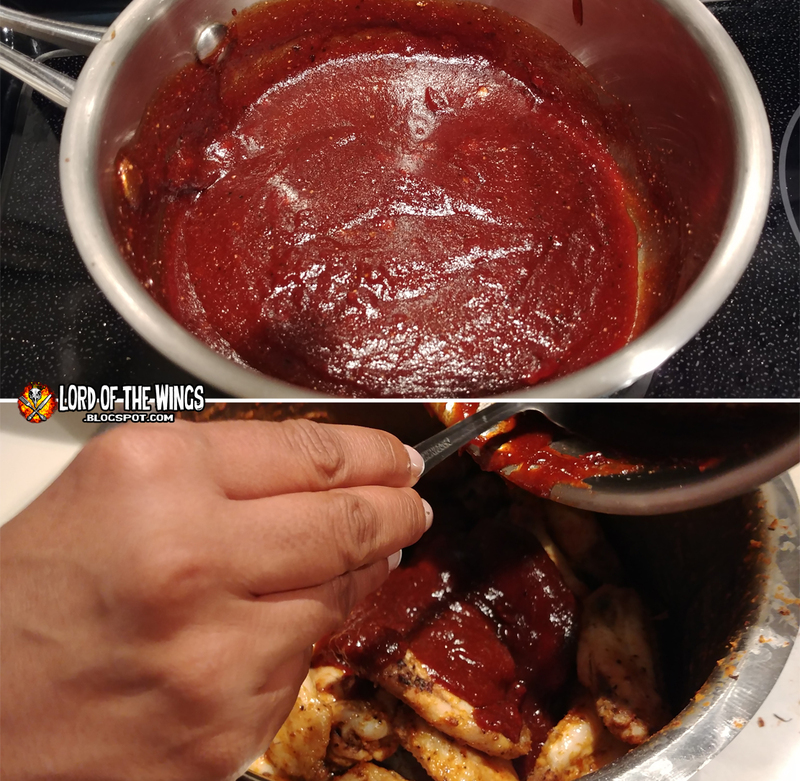 This traditionally referred to how much sauce is on the wings, but I'm adapting it to include seasoning for those wings that have a dry rub. This is the evaluation of the wing based on qualities I look for in a wing. SIZE: How big, because in wings, size does matter. How long are they? The tiniest wings are a 0, and Jumbo is a 3. MEATINESS: How much meat on the bone is there? 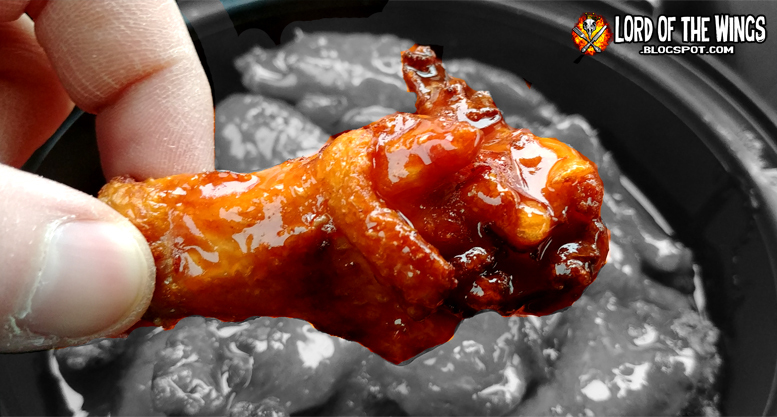 A wing could be large or small, but the meat can totally change that size. Also is the meat tender, or tough? No meat is 0, very meaty is 3. TEXTURE: What is the texture of the skin? Is it crispy? Mushy? Depending on the style of the skin, an extra crispy skin is a 3 while mush is a 0. FLAVOUR: How good is the wing. I've boosted the rating up to 5 from 3 because this is the most important part of the chicken wing and wings that were soo good in the old score was being overshadowed by size. So let's see how this re-balancing goes. Section C is the recap of extras around the meal. 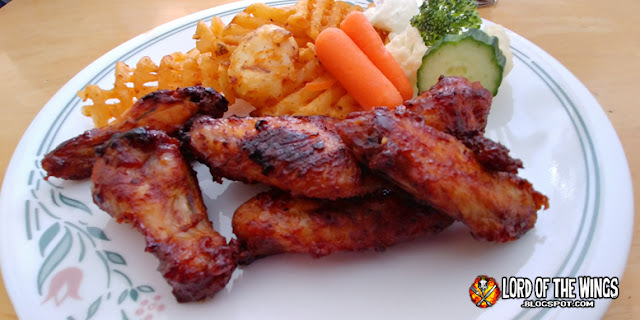 SIDES: What comes with the wings? Veggies & Dip? Fries? CLEAN UP: What does the restaurant give to help you stay clean - napkins, wetnaps, a wing plate/bowl? 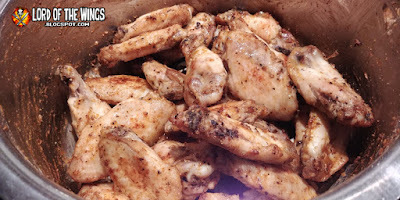 WING NIGHT: If the place has deals on chicken wings, this is the info you need to know. And if they do, they get a bonus point. But I don't score places like pizza joints because they would never have a wing night. OTHER: Any other info about the restaurant experience: are there free refills on drinks? Is there good service? Unique features? 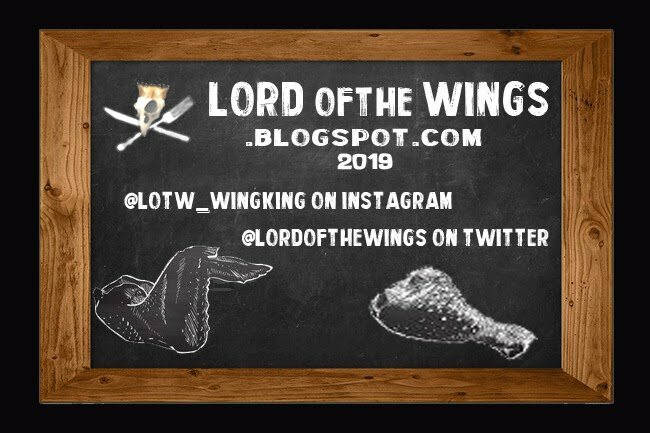 TOTAL: The recap of the wing experience. Ultimately this list and this blog is for me to keep track of what I like and don't. It may not reflect things you look for in a wing, but feel free to make suggestions to improve the score. The information is as up to date as of the time of the review, with the month and year is recorded on the Score. My addiction seems to know no bound. 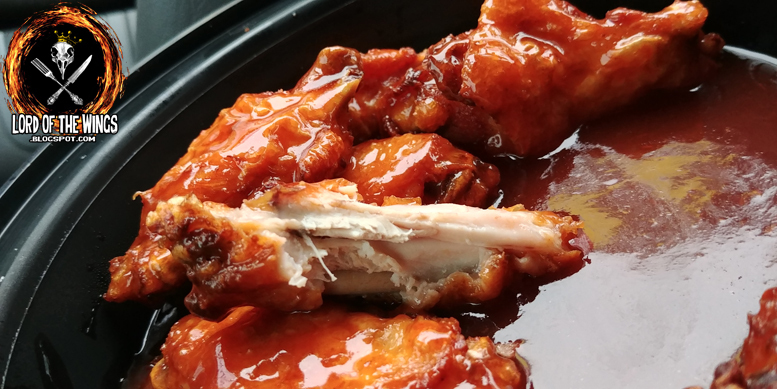 For over 10 years I have been getting these wings and every time I regret it. The package looks so tempting, and even in their semi frozen state they look plump and tasty. These need to be baked, but the sauce turns the wings to mush. 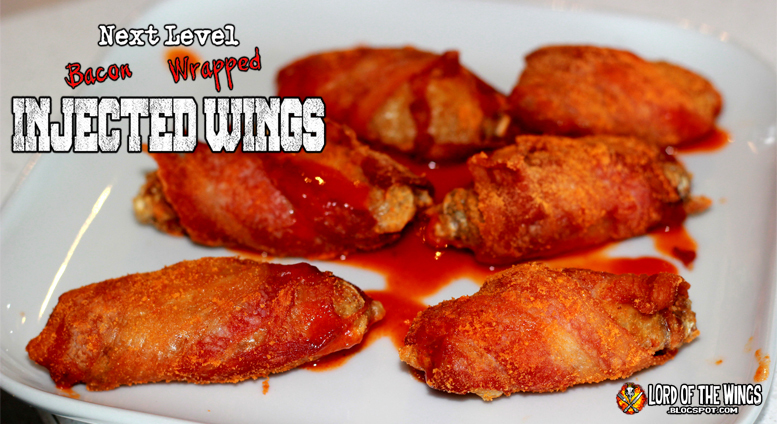 It's super salty and you can taste the fatty wings. I almost like the taste of them now. It's sick. I'm sick. Oooohh so that's what he was looking at - this blog!!! I'll be honest, I don't care about football at all, let alone the Super Bowl, but I do love Super Bowl food. When you think about game day food, chicken wings is #1. In fact, more chicken wings are ordered on Super Bowl Sunday than any other day of the year. 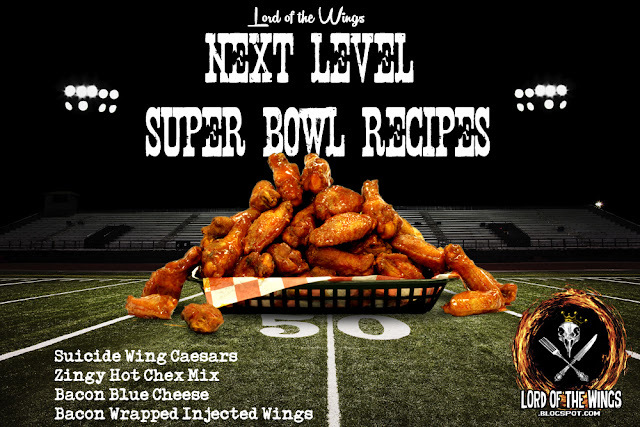 Now when you do up Super Bowl eats, you want something above and beyond. So I developed 4, NEXT LEVEL recipes for your event. 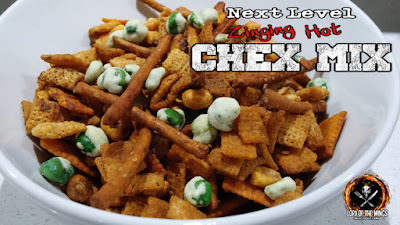 These are extreme flavours that will ensure you win over your crowd whether or not your team is winning. Touchdown! OK, so it's game time and your crew has probably been drinking a bunch of beer. But maybe you have some folks who don't want an ale. Or maybe you have someone like me who isn't a drinker, but if I do, a Caesar is my drink of choice. 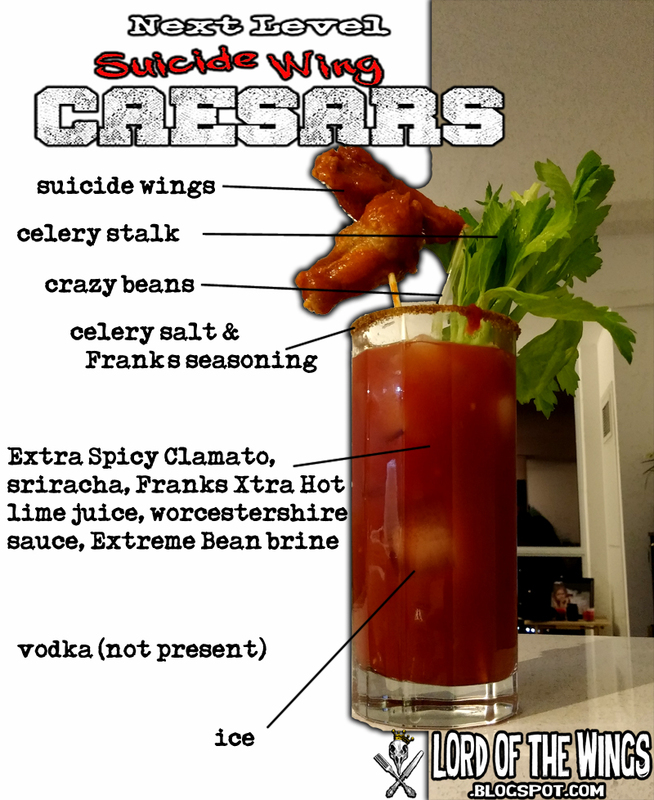 What is a Caesar? 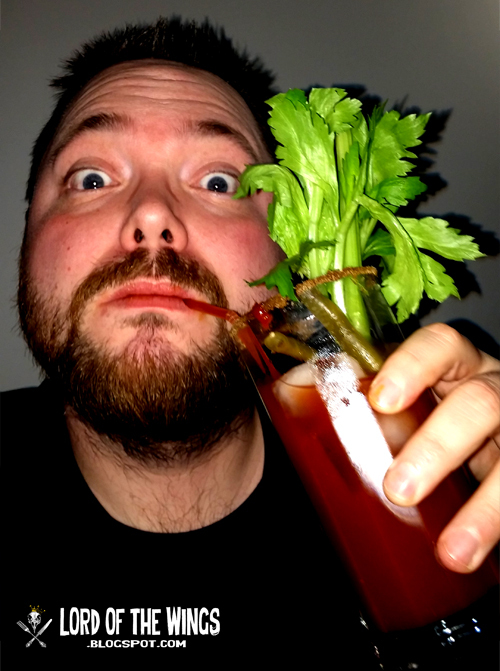 You might be more familiar with a Bloody Mary - this is the Canadian edition that uses Clamato instead of straight tomato juice. What is Clamato? Clam juice in tomato juice. I know that sounds gross, but it isn't. It doesn't taste fishy or anything. In fact, I can't drink tomato juice (makes me want to puke) but I can drink Clamato. 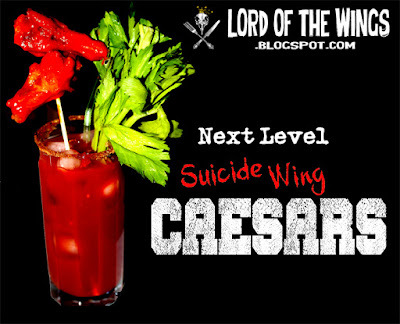 Caesars are savoury cocktails and a little spicy ... and when you make them like I do ... they become NEXT LEVEL. 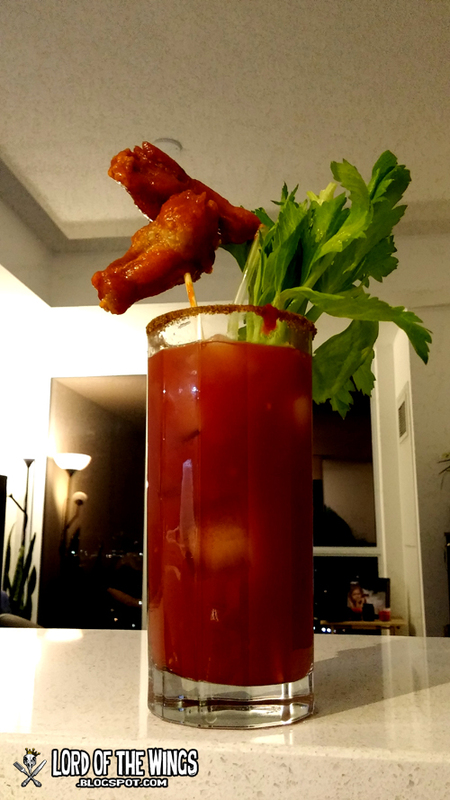 The Garnish - stuff to make the drink look even more impressive. This recipe is for making a single cocktail - there is a lot to go into the cocktail, but it is Next Level. The first part is the rim. This is to apply seasoning and added flavour to the drink. 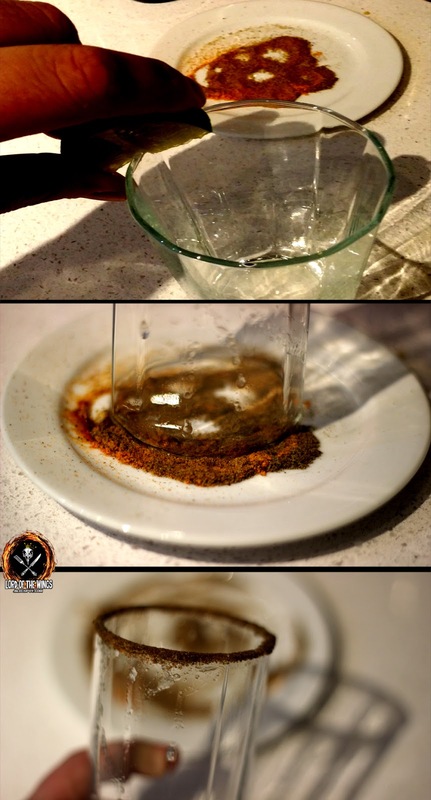 After its rimmed, add your ice, then all the cocktail parts of the drink. Stir together. The last part is to add your garnish - washed and dried celery stick (maybe you already used your celery to stir the drink?) and take 2 fried and sauced chicken wings, impaled on a skewer. Add a straw. BOOM - Suicide Wing Caesar. What does this drink taste like? Amazing. First off, you have the presentation - a forrest with giant chicken wings, a red crystal moat, and blood red lake of drinkable fire - how can you not like that? 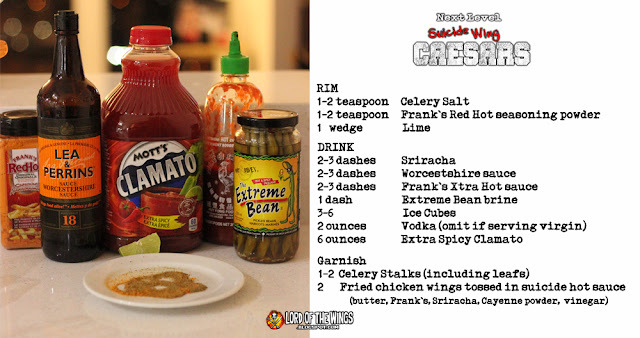 This cocktail has a lot of heat here from the Extra Spicy Clamato, the Frank's X-tra Hot sauce, Sriracha and extreme beans. But then you have that salty kick from the rim, coupled with the tang of the Extreme Bean brine and the lime juice. Then you have tomato/clam drink. When you have a drink, you're mouth is going all over the place - it's an experience not just a beverage. Then you bite into a chicken wing and well you are just going on an adventure. Now I don't drink (or very rarely) so I made this virgin, but add vodka. Do it, and you've got a whole new dimension t the drink. Suicide Wing Caesars are truly fit for an emperor!